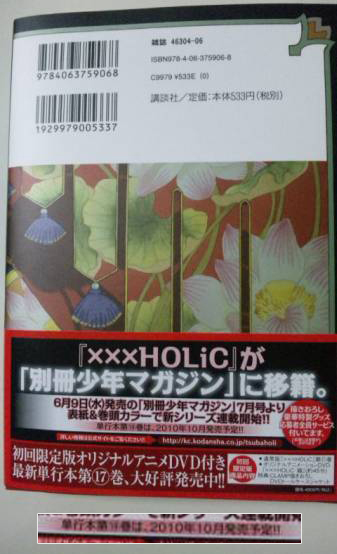 The backside of the obi-strip that came with volume 17 is announcing that XXXHOLiC #18 will be released in October. As we know, XXXHOLiC will be back in June, if we consider that volume 18 will have chapters from June to October, that gives us an average of 36 pages per chapter. But Kodansha might give a one month difference between the release of the tankoubon, in that case volume 18 would have chapters from June to September (assuming no breaks are taken in both cases), which gives us an average of 45 pages per chapter. Either way, looks like the monthly chapters of XXXHOLiC will be as large as monthly chapters normally are, which is good! Btw, my MSN for now is syaoran@tsubasaproject.net! 80 pages? Where did you hear that? If that really is so than I expect they will finish off the other two series before starting on that one, or at least xxxHolic. Where can I find the new OAD to watch on-line? Still no place to see it yet??? It’s not available yet. I will post the link here once it’s available. Yay~ It’s basically the same time (they always used to take lots of breaks) except that this time they will make more pages. “HAPPY I Tsubasa RESERVoir CHRoNiCLES Commemorative Day”!!! !